By providing your child with open ended learning opportunities like loose parts play, you can support their love of being creative. 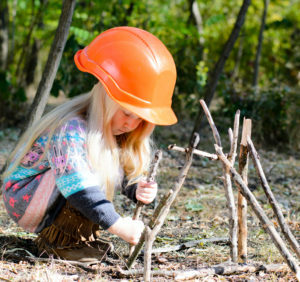 To make this possible, it’s vital to ensure that you have the right resources available.zLoose parts enable children to collaborate and work together, which in turn builds their planning, negotiating and problem solving skills. Nicola Butler, chair of the campaigning charity Play England says: “At the toddler stage, play is all about exploring everything around them and working things out for themselves, through new experiences. When they’re playing, they are completely absorbed, concentrated and learning at this time. In Quality Area 3, we also learn about the importance of sustainable practices, and the multiple purposes of resources. What better way to teach children about sustainable practices than to introduce recycled items, and have them think about its different uses? A great way to source these materials is by asking families if they could help out and bring in cleaned, recycled items for you to re-use. You could also contact local communities/businesses for donations of things they no longer need. They will be happy to give them away and not have to worry about disposing their unwanted goods themselves. Think about natural and recycled materials. Below are just a few things that are cheap or free to locate and are redesigned by the children daily. Natural materials could be everything from pebbles, sand, and bamboo to flowers, sticks and twigs. On the other hand, recycled materials could range from cardboard tubes and milk crates to kitchen utensils, clothing pegs, tyres and buttons to name a few.